MIAMI, Florida (CNN) -- Tropical Storm Hanna moved through the Bahamas on Thursday and headed toward the Carolina coast with 65 mph winds, the National Hurricane Center said. 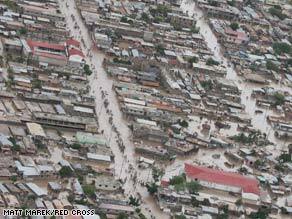 Water fills the streets of Gonaives, Haiti, on Wednesday after heavy rains from Tropical Storm Hanna. Hanna may make landfall near the North Carolina-South Carolina state line late Friday night or early Saturday morning, the hurricane center said. Both states, as well as Georgia, have activated their emergency centers ahead of the storm, and North Carolina Gov. Mike Easley declared a state of emergency. "It now appears Hanna will be a Category 1 hurricane when it hits the North Carolina coast early Saturday morning," Easley said in a news release. "Since the exact path is uncertain, everyone who lives in the coastal counties needs to be ready." South Carolina Gov. Mark Sanford urged the voluntary evacuation of two northeast counties, Horry and Georgetown, as the storm approached. "The suggestion is for people to look at this storm and make their own decisions," he said. "Every one of us needs to continue to watch out in the Atlantic because this could be a dress rehearsal for a thing called Ike," he said, referring to Hurricane Ike, a Category 4 storm spinning in the central Atlantic, hundreds of miles from the U.S. coastline. "Time will tell," Sanford said. Hanna was about 540 miles south of Wilmington, North Carolina, at 11 p.m. ET Thursday, according to the hurricane center. Hanna caused massive flooding in Haiti when it pummeled the Caribbean nation earlier this week, killing 137 people, a government official said Thursday. Rescue workers are trying to get aid to affected victims of the storm, said Abel Nazaire, the assistant coordinator of Risk and Disaster Management. Another 79 people were killed in Haiti by Hurricane Gustav last week, said Louis Pinchinat, deputy director of Haiti's Civil Protection Directorate. On Wednesday, Haitian President Rene Preval appealed for international help in the wake of "catastrophic" flooding, Nazaire said. As Hanna approached the East Coast, Charleston, South Carolina, prepared for the worst. Workers started boarding up buildings Wednesday, and firefighters filled sandbags and distributed them to residents and business owners. Backup generators were being gassed up and positioned at key locations around the city. "We will continue until we know we're totally out of the woods," Charleston spokeswoman Barbara Vaughn said. Cathy Haynes, Charleston County's director of emergency operations, said county schools will be closed Friday. "We'd also like to encourage residents that either live in low-lying areas or mobile homes, or if they just feel vulnerable to the situation at hand, to maybe move to safer locations," she said. Jennifer Moses, a resident of Charleston's Daniel Island, said she was ready for whatever came. "I filled up the gas can, I have water, I have peanut butter, and I took the rocking chairs off the front porch," she said. Charleston sits on a peninsula between two rivers and is extremely prone to flooding. Recent downpours from the remnants of Tropical Storm Fay left a foot and a half of water on some streets. But the city hasn't had a mandatory evacuation since Hurricane Floyd in 1999. Traffic then was so congested that it took up to 19 hours to drive inland to Columbia, usually a two-hour trip. At Parris Island, South Carolina, hundreds of Marines graduated Thursday morning from basic training -- a day earlier than planned because the base didn't want Hanna to cause problems for families coming to the celebration, Master Sgt. Mark Oliva said. However, Oliva said the base's emergency center was standing down, as the storm's track seemed to put Parris Island out of harm's way. Trailing Ike by about 1,600 miles in the eastern Atlantic was Tropical Storm Josephine. Josephine's winds had dropped to 45 mph, and the system was not forecast to make landfall any time soon.